I love the fact that the “apartment” is actually writing to itself. Draw your attention to the top right (under the sponge) the note is written on stationary from her private high school, Phillips Exeter Academy. I just think that’s a nice touch. 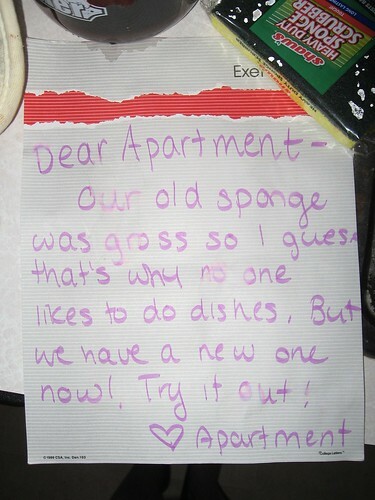 i like how she left the wrapper on the sponge for someone else to take off before they delve right into those dishes. Interesting choice of post… have you confronted her about this messiness? If not, maybe we are being a little hypocritical with our passive aggressive tendencies? Wow. The house can talk! #7 is that a calligraphy pen?